Blueprinting is the name Tridion uses for creating a hierarchy of publications. Every publication in the hierarchy contains a specific website building block (XML schemas,content, templates, layout, applications). Each child publication inherits the building blocks of its parent(s). The publications lowest in the hierarchy are the publications where content, layout and applications come together and form a website. The building blocks inherited from a parent publication are read-only unless you “localize” (i.e create a local copy) them. Choosing the right blueprint for your organization is critical to the success of a Tridion implementation. If you fail to get the blueprint right then future changes to it will prove to be very hard and the usability of the system very low. 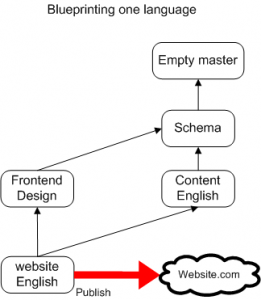 Even the initial implementation of a simple, one language and one channel, website will be a daunting undertaking and will remain a challenge during the entire product life cycle. An example of the most elementary blueprint can be seen in the graph “blue printing one language”. 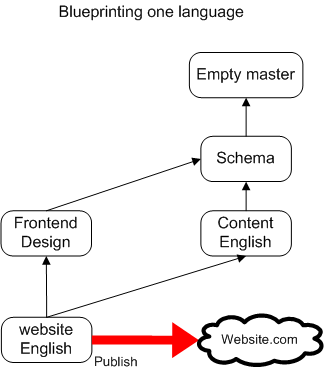 It is a simple blueprint which gives the flexibility to add additional languages or adopt new channels in a later stage. As explained before, publications should contain only one type of the building blocks which make up a website.The reason for putting all these different types of building blocks in different publications is to make them reusable. If you adopt this policy it is very easy to create a new website, even without any programming, by reusing existing building blocks. An example of this is the Equens project. 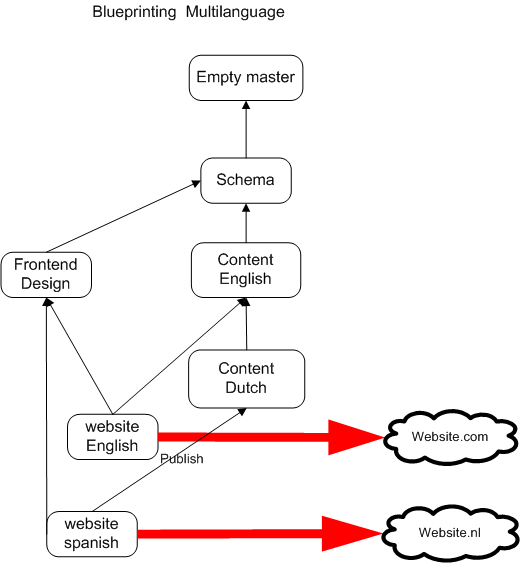 During this short project (within a month) we created no fewer then six new websites in 3 languages (Dutch, German and English) by adding six new content publications and extending the blueprint.